This mini, online tutorial e-course teaches you how to write a narrative-style college application in less than one hour! 15 downloadable handouts that include sample essays by real-life students, topic tips, StoryFinder™, sample outlines, my AnecdoteBuilder™, and more. 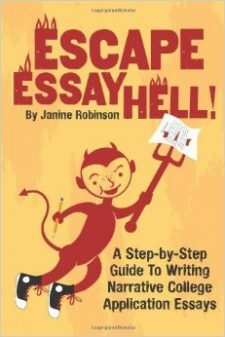 Unlimited access to digital versions of all 4 Essay Hell writing guides: Escape Essay Hell! ; Heavenly Essays; Writing Survival Kit and 2015-16 Prompts Primer. The video tutorials walk you through 10 simple steps through the brainstorming, outlining, writing and editing process, which results in a standout personal statement essay. Start anytime and work at your own pace. My concentrated, on-demand course is ideal for college-bound students who need to write personal statement essays for The Common Application, as well as other core essays for universities, graduate programs (med, law, business schools), scholarships, transfers, internships and other educational institutions. It’s also perfect for parents, teachers, high school counselors, college admissions counselors and educational consultants who work with students on these dreaded essays, and want to understand what makes them effective and help students write their own. I offer significant discounts to educators and counselors who want to purchase the course in bulk for their students. In this concentrated course, I literally step you through the exact approach I use with my private students–-helping brainstorm a unique topic, find your real-life stories, map out a writing plan, learn powerful literary and creative writing techniques, and finally edit and polish your “slice-of-life” essay. Along with my short video presentations, I share the most effective tips and advice through instructive handouts and worksheets, which include sample essays from real students and the most helpful excerpts from my popular essay writing guides, published on Amazon. The course also includes my ProblemFinder™ andAnecdoteBuilder™ handouts, which walk students through a quick-and-simple formula to identify and spin a real-life moment into an engaging anecdote. I know how busy you are, so in this crash course you will quickly learn exactly what you need in your essay to set you apart from the pack, and then the steps (brainstorming, writing and editing) you need to take to write your own. All 10 instructional videos are well under five minutes each—so you can watch them and review all the handouts easily within several hours. The rest of the course is the time you take to craft your outline, rough draft and final draft along the way—all at your own pace. Bootcamp students also will have free access to the entire Essay Hell Library, which includes complete online access to my popular writing guides: Escape Essay Hell; Writing Survival Kit and Heavenly Essays. (about a $30 value in themselves). Students will have unlimited access through the end of 2019. You can move through these steps all in a single day, or over a week or two, or several months. It just depends on how fast you work. But by the end, you will have a killer college application essay in hand that reveals what makes you you–and will be the most potent and personal component of your college application. Also, without even trying, you will have dramatically boosted your writing ability and learned language tools and techniques that will help you once you land in your dream college, as well as with future projects in the workplace.